Madeira is a Portuguese island group located just off the west coast of Africa (about 300 miles from Morocco) that has become a popular American tourist destination in the winter season. However, while winter may be a popular season for travelers, spring is a great time to visit to see the lush vegetation of the islands in full bloom. 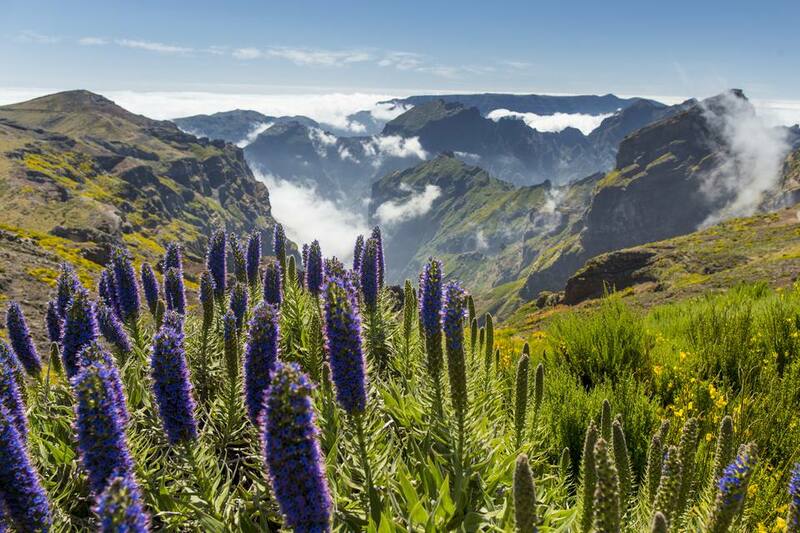 Madeira Island and the nearby Tenerife Island are both called "the island of eternal spring" since the climate is rather enticing in both destinations year-round. For instance, the average high in December hovers around 69 degrees Fahrenheit, and in the summer, the average highs don't crack 80. As a result, this small archipelago provides ample opportunities for outdoor adventures throughout the year. Although there aren't many cities to visit on Madeira Island, it's easy to stay a week in its capital, Funchal, which can serve as a hub while you explore the life and culture in smaller towns nearby. Madeira was discovered by Portuguese sailors in 1418. The archipelago is made up of the main island of Madeira, the Madeiran's island paradise of Porto Santo, and the pair of deserted islands called Selvagens and Desertas. Madeira Island, the largest of the island group, is 57 kilometers long and has over 150 kilometers of coastline. Located on the island, Funchal is the largest town and capital of the Madeira Autonomous Region, with a population of just over 100,000 people. Unlike the green Madeira, Porto Santo, called the "Golden Island," has little vegetation but its 9 kilometer-long beach and moderate climate make it a major tourist draw for folks looking for tranquility if not desolation at the edge of Europe. Most of the population of Porto Santo lives in Vila Baleira, where you can visit a Christopher Columbus museum in the house reputedly occupied by the famous explorer. However, the rest of the island provides ample outdoor adventures worth discovering as well. There are two airports in the island group, on Madeira (FNC) and Porto Santo (PXO), and Madeira and Porto Santo Islands are the only populated islands among them. However, there are ferry routes to Porto Santo, Selvagens, and Desertas from Madeira, which depart every morning around 9 a.m., which you can use to access the islands once you arrive by plane. There's no shortage of fun things to do on the island of Madeira, from outdoor adventures through World Heritage sites to annual festivals and events in the island's major cities. Whatever time of year you visit, you're sure to find the perfect activity to add a little extra to your trip to the Madeira Islands. Madeira Carnival: A big attraction in Funchal with events year-round. In spring, there are the flower celebrations, and in summer, the city hosts a Limpet festival. Blandy's Wine Lodge: Located in the heart of Funchal, this destination offers tours featuring 200 years of Madeira wine. You can also book a stay at the famous lodge or attend one of the events hosted there throughout the year. Monte Toboggan Rides: There are plenty of unusual ways to get around Madeira, but taking a toboggan sled from Monte down to Livramento, Funchal, has been a local favorite since the 1850s. You can start your journey down the two-kilometer hill at Nossa Senhora do Monte Church. Madeira Story Center: An interactive museum in Funchal that tells the history of the Archipelago through permanent and rotating exhibits. Laurisilva: A UNESCO World Heritage site easily accessible from anywhere on the islands that features a laurel forest full of unique wildlife like the Madeiran long-toed pigeon. Lavada Walks: Travel down shallow canals carved by 16th century Madeirans carrying water from the wet areas in the north to the more parched areas of the south. Since these canals pass through the forests of the island, they tend to be quite scenic for a day-long walking tour. When it comes to finding a place on the islands to stay overnight, Funchal is the most popular destination on Madeira for overnight accommodations. Here, you'll find a variety of waterfront resorts and cost-efficient room rentals perfect for any budget or travel itinerary. For budget travel, you can enjoy a fabulous stay at the Pestana Carlton Madeira on the waterfront of Funchal. The site offers a low price guarantee, which is quite reasonable for the quality of the hotel. If you'd rather escape into the woods that surround the city, you can choose from one of many pousadas in the Luarissilva forest like the Pousada Dos Vinhaticos. In Portugal, a pousada is a government-owned and operated hotel or resort that serves traditional cuisine and is often housed in a converted historic landmark. You can also head up to the luxurious Quinta do Monte is in the heart of Monte in the hills of Funchal, or for an intimate escape, spend Valentine's Day at Reid's Palace Hotel, which offers special couples' retreat packages during romantic holidays and celebrations throughout the year.